Hilton Hotima -  An epic journey of new discovery so fantastic that our natural instinct would be to block it out. George Clements decided to become a vegan at the age of 9 after reading a book about health at school. He worked as a fruit picker alongside his mother from a very young age, so he was able to snack on an endless supply of fruit throughout the day. He noticed that this diet gave him an abundance of energy and unparalelled vitality. He lived as a breatharian – fruitarian for almost 80 years. He believed that he would live to be 150 years of age, but unfortunately he only lived to be 92. George R. Clements. Age 24. 1902. Quincy. Illinois. Hilton Hotema authored numerous books on dietetics, fasting, fruitarianism, breatharianism, vitality, cellular regeneration, longevity, higher consciousness, spirituality, alternative medicine and ancient wisdom, published by Health Research Books, Washington. He collaborated with Herbert Shelton,  and Hereward Carrington. His contemporaries included Walter Siegmeister, Theos Bernard, Alexis Carrel and Johnny Lovewisdom, who wrote about related subjects. In Man's Higher Consciousness, Hotema wrote that man was designed to live 80,000 to 100,000 years, before his teeth and alimentary canal were subject to degeneration. It was published in 1952 as Man's Miraculous Unused Power using the pen name Kenyon Klamonti. According to the Natural Hygiene Society, Hotema believed he would live until 150. 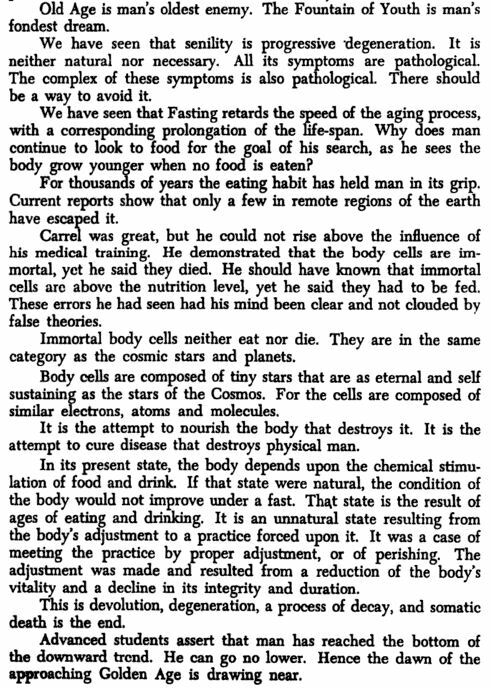 Hotema is documented in the book The Struggle Between Religion & Science by Marshall J. Gauvin. In addition to writing his own books, Hotema provided many introductions to the systematic reprintings of rare, out-of-print, esoteric books published by Health Research of Mokelumne Hill, California during the 1950s and 1960. Man's Higher Consciousness by Hilton Hotima / Free Pdf. The Mystery of Man by Hilton Hotema / FREE Pdf. 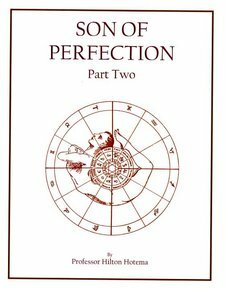 Son of Perfection / Hilton Hotema / Pdf. The following is a list of publications written by George R. Clements. How High Do You Climb? There are a lot of questions surrounding Hilton Hotema’s death and it’s something people ask about pretty often. They want to know how he died and whether he lived his life the way he claimed. There have been some rumors supposedly circulated by his original publisher, Health Research in Mokelumne Hill, CA, that Hilton Hotema died from a motorcycle accident in 1970. This is simply not true and it was really quite comical the first time I read it. ​Perhaps his publishers were afraid he might lose some credibility if it was found out that he died of natural causes. I guess they wanted to make sure they could go on selling his books. This is really the only explanation I can think of in regard to the motorcycle story. There were actually a lot of rumors that went around. My grandmother said that awhile after he passed away, some of his followers would call to ask about him and they were shocked to find out he’d died. She said that they suspected foul play, but that wasn’t the case. He was very careful with his health and he was very, very smart. His logic was correct, but unfortunately his body did inevitably wear out and he passed away peacefully in his sleep on August 9, 1970 at the age of 92. He did indeed practice what he preached. He ate fruits and vegetables primarily, as well as beans. He also walked just about everywhere he went. Everyday he would walk to the post office in the town of Sebring, FL where he’d lived since the 1930’s. He took very good care of himself, making sure he gave his body the best possible fuel while staying active. He was a bit hard of hearing later in life, but otherwise he was in very good health. Honestly, I’m not sure how he would feel about the truth being out there because he was such a private person. I started this website to celebrate his life and his written contributions, which I believe far out-weigh one theory that was ultimately incorrect. The original typed piece written by George R. Clements. The photo above was taken about 10 years ago – a picture of some of the land purchased by Hilton Hotema when he moved to Florida. He was an Indian Agent in Oklahoma and because the government paid him in cash he was able to buy land in Florida for 25¢ an acre. During the French and Indian war, 1755-1757, a band of Mohawks from the area that became New Hampshire, raided a white settlement in Massachusetts near the line between the two states, killing the men and carrying off the women and children as captives. Among the captives was a white woman named Johnson whose husband was killed by the Indians. In time she became the wife of the tribal chief, and some 10 or 12 years later she returned to her old home in Mass., with 3 half-blood children, two girls and a boy. The boy grew to manhood, married a white woman, and to them were born 5 children, 4 boys and a girl, named Alfred, Finn, John, George, and Lydia. Finn died at the age of 96 and John at 97. We were never told the ages of Alfred and George when they died. Lydia Johnson Nutting, maternal grandmother of these 8 children, was a quarter-blood Mohawk. Her mother was a white woman, her father was a half-blood Mohawk, and her grandfather was full-blood Mohawk. None of them had any education, had never attended any school, and most of them could not read nor write. Those who could read and write learned it at home. One of Lydia’s grandsons, George had such a craving for knowledge when he was a boy, that he went to college and graduated in shorthand, typing, law, became a doctor of chiropractic, and on July 14, 1927, was ordained as a minister by the Spiritual Psychic Science Church, Inc. of Los Angeles, California. He established a health magazine in 1920, published it for 26 years, became a professional writer in the field of Creation, Life and Man, and has written more than 40 books dealing with these vital subjects. The parents of Frank A. Clement died when he was a little boy, and his maternal grandparents kept him until they died. Then he lived with his uncles and aunts until he was old enough to go to work and provide his own home. He never went to school but he could read and write. He had no brothers nor sisters, and knew nothing about his forefathers. That part of his life was blank. Robert and Raymond died in infancy, and it was their early deaths under medical care that inspired me to become a doctor of chiropractic, for the death of those two babies showed me there was something decidedly wrong with so-called medical science, and I found out that it is — there is no such thing as medicine; all so-called medicines are poisons and that fact is admitted by medical history. And so the medics give a poison to a sick person they would never think of giving to a well person. Never take any poison called medicine. One man paid $100.00 for his family tree, and after he got it, he paid another $100.00 to keep the matter a secret, as he was very much ashamed to learn the history of his ancestors. Well, ours runs back into people who could not read nor write and into the Mohawk Indian Tribe. You might have noticed that when he first mentions his father, he says his name was Frank A. Clement, not Clements. Originally, George’s name was indeed, Clement. George Clement served in the U.S. Army during the Spanish American War (1898). ​He was serving in a regime with several other men with the last name Clement, so there were a lot of mistakes whenever the mail was delivered. To differentiate himself from the others he added an “S” to Clement and also added the middle name Robert. He did not have a middle name before that, so from then on he was known as George R. Clements. There was a family rumor circulating for awhile that we’re related to Samuel Clemens… that during the war they’d added a “T” to Clemens to make it Clements. I think that was a very amusing misunderstanding, but the truth is that he added an “S” to Clement. As for the Mohawk Indian Tribe… I suppose that’s why my skin takes on a reddish tan every summer. People have asked before if I’m sunburned, but it doesn’t hurt. It’s just the remnants of Native American blood running through my veins. WHY SO MANY PEN NAMES? George R. Clements valued his privacy, but beyond that, I’ve wondered why he wrote under so many different pen names. He was known more commonly as Hilton Hotema, but he also wrote under the names Kenyon Klamonti and Dr. Karl Kridler. One of his family members said that the Post Office in Sebring, FL had begun to refuse to send out his newsletters, so he started writing under a pen name. And once they refused to send out newsletters written by that name he moved on to another pen name. So it was the censorship imposed by the U.S. Post Office that required him to take on new identities to continue to spread his message. The name “Hilton Hotema” is a rather unusual name, but looking back through George Clements’ history we found that he might have combined two names of men he knew and respected earlier in life. Boyd Hilton was a Choctaw Indian pictured in Hilton Hotema’s book “How I Lived to Be Ninety.” Naturally, we suspect he used his last name for the first name of his pen name. We also came across the name of a Choctaw Indian named Rev. Solomon E. Hotema (“Tissy”) who was frequently mentioned in early Choctaw Nation history, as he was a representative and senator, and also a good friend of principal Chief Wilson. He was highly educated and a very prominent Choctaw leader amongst his people. Unfortunately, his story is not a happy one… On April 14, 1899 he was convicted for murdering three of his neighbors that he claimed where witches and caused his children to die. During this period, several people in the community died from unexplained ailments, probably yellow fever or dypyheria, or any number of other diseases being passed around at the time. ​However, when Solomon Hotema’s young daughter died he started looking around for an explanation, and in his grief he convinced himself that “witchcraft” was the cause. Under the influence of alcohol, he killed an old lady who everyone in the area believed was a witch, and in the process injured two children. Then he killed two other people, a man and a woman each at different locations. He was acquitted for killing the old lady (witch) on an “insanity” defense; however, he was convicted on the other counts of murder. Even though he confessed, he was tried three times using a plea of insanity, with the last going to the U.S. Supreme Court where the conviction was affirmed and he was scheduled to be executed. However, President Teddy Roosevelt commuted the sentence to life imprisonment. Solomon Hotema died around 1907 in a prison in Atlanta, Georgia. Samuel Webster, grandson of Solomon Hotema, and Judge Thomas Chauncey Humphrey with the gun Solomon Hotema used to kill three people.